Before you came to work for Brick by Brick, you were in practice at a prestigious hospital in Kampala. What inspired you to leave the big city and come to work in the rural Rakai and Kyotera Districts? Before joining Brick by Brick Uganda as a full-time employee, I had a chance to train and mentor health workers in the Rakai and Kyotera Districts. My experience with the midwives, doctors and in the health facilities was an eye opener. It helped me understand the burden of providing quality maternal and newborn health services to our rural communities. Every time I visited a facility, I saved a life. Often the health workers did not know what to do and were sure the patient was going to die. Maternal and newborn deaths and stillbirths were, unfortunately, an accepted tragedy. The basics of labour monitoring, like listening to the fetal heartbeat with a fetoscope, and using a partograph to help guide decisions were not used and were also not available. Operating theatres were always closed. Maternity wards were left to young nursing students. I remember that every time I stepped into Rakai or Kalisizo Hospital, I knew I was going to end up in the operating theatre with at least two complicated surgeries. I never left the hospital until late in the evening. On one occasion, the district doctor had to leave me at the operating table and practically walk away because he thought we had lost the patient after a long struggle to remove her bleeding uterus. I taught the doctors several lifesaving skills, but even when I returned to Kampala, they kept calling me all the time to help make difficult decisions for their clients. The lives of the women and babies that were saved in the many mentorships I led, made me decide to leave my home and do more for these communities. What are you most proud of that the BAMA Program has accomplished? While HIV has been well known in Rakai and Kyotera Districts, maternal health was often forgotten and was not so much of a priority until BAMA arrived. I remember the very first time I stepped into the Resident District Commissioner’s office (Representative of the President in our districts). I was trying to ask him to give us some time for technical support supervision in the health facilities. The questions I had to answer almost made me give up, since he knew only one Implementing Partner in the district and had never heard of us. Over the past three years BAMA has become a district-led program in all its interventions, and that makes me very proud. Over the past three years, Brick by Brick has made a major impact in improving maternal health, decreasing maternal mortality in our partnering health centers and hospitals by over 60% We know you work with limited resources, what has allowed you to see such impressive results? This has been a collective effort of the Brick by Brick Uganda Senior Management , the Ministry of Health, District leadership, health facility administrators and health workers. There are so many evidence-based interventions that have been proven to work in many programs. With BAMA, apart from the technical trainings in emergency obstetric and newborn care, as well as our mentorships, some things were not done according to the books. We devised our own ways that we thought would work for us with minimal resources. For example, we have invested a lot of money mentoring close to sixty midwives in our lower units. We decided to mentor the midwives and doctors in the higher units and then bring the ones from lower levels to be mentored within their respective district hospitals. Our quality improvement score cards are designed based on what we want to improve on the ground and not what is internationally used by big programs. Some of these methods have been presented to the Ministry of Health and are going to be adapted elsewhere in the country. Our BAMA staff has also done much of the work ourselves, and this has helped us save funds that would have been spent hiring specialists. At times, we have had to move to our health centers and hospitals to manage severe complications ourselves. There have been many sleepless nights on the phone mentoring and advising health providers. I have performed major ward rounds and all the difficult surgical cases were booked by the district medical officers so that we could do them together. I am so grateful to our funders and Executive Directors who are always willing to provide what we asked for. I recall telling my immediate supervisor that I am not going back to Rakai unless you create a small budget that will enable us have at least a needle holder for surgeries. I had done several surgeries stitching with artery forceps and using natural light with no scrubs or aprons and this was risky for my health and even my life. In a few months, headlamps were shipped in, and we had some money to purchase caesarean section sets. We used the balance to purchase delivery sets, which we opened and soon started dividing instruments according to what each of our 21 Health Center IIIs were lacking at that time. The challenges have been many since program inception and they have kept changing and being solved. The very first one was lack of equipment in the facilities. The continuous stock outs have also been difficult. But then we decided to spend funds on providing buffer stocks, which has made a real difference. I remember one day, a doctor in Kalisizo had booked an elective caesarean for a 40-year-old who had no living child and had undergone several other abdominal operations including myomectomies. (removal of uterine fibroids) After scrubbing and draping, as we waited for the anaesthetist to administer ketamine, we were told there was only a dose for a child. The drug store was also stocked out and the family had to buy the anaesthetic drugs from a pharmacy which was outside the hospital. Sadly, due to the delay we lost the baby. With the support of the BAMA Program and our district partners, these shortages are much less frequent but the challenges are still there. The greatest current challenge is the lack of human resources. We now have the Saving Brains/Mama Ambassador Project, which is very exciting and challenging. The same number of staff who are supposed to implement the BAMA Program, have to also implement the Saving Brains Program. This is compromising some activities in the BAMA Program, although we try to stretch to our abilities the best we can. If you could double your budget, what would you do first to expand the impact of the BAMA Program on the health of mothers and babies? Without a second thought, I would invest in the transportation of pregnant women to the health facilities for Antenatal Care, delivery and postpartum check-ups. Secondly, I would invest in publishing the work that Brick by Brick Uganda has done. If the world could read about our implementation strategies and methods, we would have other opportunities for funding as well. I received a call from the District Health Officer from a neighbouring district in 2018 asking us to extend the BAMA program to his area. The team from Rakai had made a presentation and they were asked to share our contacts with other District heads. So, if the funds were available, I would expand the BAMA program to other districts. This year you have launched our Saving Brains/Mama Ambassadors Program. Tell us a bit of how the work is progressing? The Mama Ambassador Project is focusing on creating peer support groups to improve the growth and development of babies born to adolescent mothers in our communities, aged between 10 and 19. This project can be looked at in two ways, as a Brick by Brick Uganda research project, but also as an opportunity to improve the BAMA program by focusing on the teenage mother and her immediate family. This program is improving Antenatal Care, health facility deliveries and has given us an opportunity to provide family planning to these young girls. In the study site, we have enrolled 165 mothers so far and 80 mothers in the control site. The young mothers are helping us to understand and appreciate the thoughts and feelings, as well as the challenges that they go through. So many stories are being shared from these young mothers, their parents and spouses. We hope to get a lot of information from this study that will enable us push the country’s adolescent health agenda forward. Is there anything else you would like to say in closing? Being part of Brick by Brick Uganda’s Babies and Mothers Alive Program has made me appreciate that improving maternal and newborn health care systems takes a lot more than just experience as an obstetrician. It requires intuition, patience, and innovations tailored to specific community needs. Above all, it requires empathy for the women and girls born and living in a society where they often lack the right to decide on so many things including her own life. Every year 45,000 babies die in the first month of life in Uganda, with an equal number of stillborns. The risk of death is five times that for babies born in the United States. The situation is much worse for babies born at home, without a skilled attendant, or in poor rural areas, such as the Rakai and Kyotera Districts where the Babies and Mothers Alive (BAMA) Program is working every day. The reasons for this tragic loss of life are the same throughout sub-Saharan Africa, lack of oxygen for babies at birth or during labor (fetal distress), infection, and prematurity. Often, relatively low-cost interventions can make a significant impact in reducing the loss of life and serious injuries affecting the long-term health of thousands of babies. For example, treating hypothermia, keeping a baby warm in the first few minutes after birth, can often mean the difference between life and death. Providing the knowledge and skill to perform basic resuscitation for babies struggling to breathe can also be a lifesaving intervention. Over the past three years the BAMA Program has been working in 48 health centers and hospitals to improve the quality of newborn care in our two districts. In 2019, we are intensifying our efforts to dramatically reduce newborn mortality and morbidity. In 2016, our work to improve the health of mothers and their babies began with the training and mentoring of all of the physicians and midwives engaged in maternal and newborn care. Having a skilled attendant at every birth is critical to reducing both maternal and newborn deaths in our communities. Starting in 2017, we began the training of mentor midwives, who are part of the Ugandan health system, and are now the core of our training and mentoring program. To date, 30 mentor midwives have been trained to ensure that the quality of care at all of our partnering health facilities remains high. In 2018, with the support of Dr Leah Hodor and Vital Health Africa, we focused on life-saving skills to help babies breathe in the first minutes of life. Through community outreach, we have worked to increase the utilization of health center and hospital deliveries, knowing that home deliveries, without a skilled attendant, are a major contributor to the increased risk of death for both mothers and babies. Our 100 Mama and Papa Ambassadors, trained community health workers, encourage all pregnant women to develop a birth plan that includes delivering at one of our partnering health centers or hospitals. In 2016, the percentage of mothers having a skilled attendant at birth in Rakai and Kyotera Districts was 66% and 76% respectively. By the end of 2018, it has risen to 78% and 87%. In 2019, we have several exciting initiatives which will save the lives of more babies. For the first time in our districts of a half million people we have established Neonatal Intensive Care Units at our two District Hospitals. From January 1st to February 10th eleven babies were admitted to our NICUs, with no deaths thus far. Stillborn and newborn deaths are 50% higher among teenage mothers in Uganda than mothers aged 20 to 29. In addition, among infants of Ugandan mothers who have not completed secondary school, 35% are stunted, 52% are not on track for literacy and numeracy development between ages 3 and 6, and 45% are not on track for socio-emotional development between ages 3 and 6. Adolescents who are pregnant are often marginalized in rural Uganda, leaving their infants particularly vulnerable to poor outcomes. This year, with the support of the Grand Challenges Canada Saving Brains Program, we have established adolescent-friendly antepartum and postpartum services at our two District Hospitals. We know that 82% of women who receive full antenatal care will deliver at our partnering health facilities where staff have received BAMA training. Throughout the developing world, millions of patients lack access to therapeutic oxygen, which is often the difference between life and death. Oxygen is an especially important treatment for millions of newborns requiring short-term respiratory support in order to survive. In 2019, we will partner with the Australian-based FreO2 Foundation. FreO2 has developed an off-the-grid oxygen concentrator that supports the availability of oxygen therapy even in remote and under-resourced rural health facilities. At Brick by Brick, we know that as a community-based organization with limited resources, we need to identify innovative partners who share our vision of health care as a right and not a privilege. The health challenges facing millions of mothers and babies are complex and rooted in chronic poverty and insufficient investment in health globally. 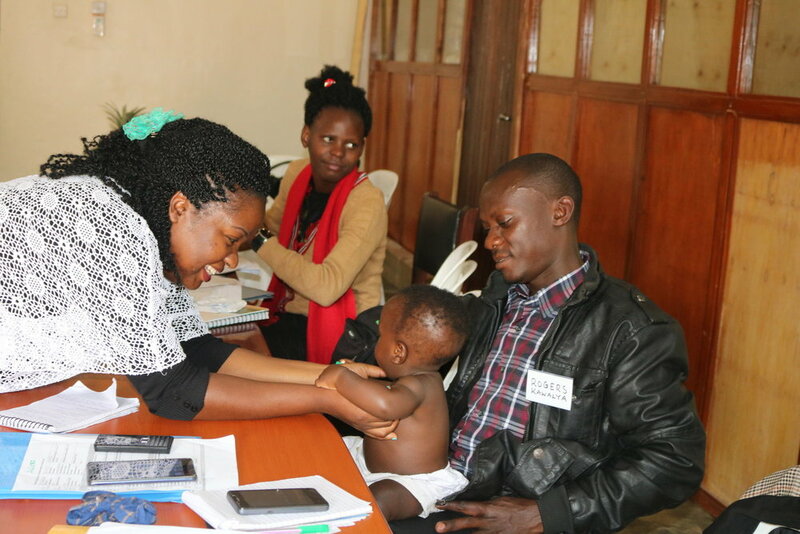 Over the past four years we have taken great strides in improving the quality of maternal and newborn care, building strong partnerships with district government and our dedicated cadre of health providers. 2019 looks to be a year of continued progress. Situation analysis of newborn health in Uganda: Current status and opportunities to improve care and survival Ministry of Health. Situation analysis of newborn health in Uganda: current status and opportunities to improve care and survival. Kampala: Government of Uganda. Save the Children, UNICEF, WHO; 2008. 2019 will be a year of new possibilities for the people of Rakai and Kyotera. Over the past fifteen years we have built an innovative model based on strong partnerships with local government and the rural communities we serve. We are often asked why we have chosen to limit our work to Uganda, and to just two rural districts of a half million people. Most international development organizations have a much broader scope, working in many countries, possessing resources we can only dream about. Sometimes ‘small is beautiful’. Only by staying focused on our local communities, can we build the strong and trusting relationships that allow us to tackle complex problems, like lack of access to quality maternal and newborn care, keeping young women in school through comprehensive sexual and reproductive health education, and building primary schools equipped to educate and care for 5000 children. Sustainable development cannot be fostered on people by ‘outsiders.’ Rather, it will only come when people join together to create solutions from the ground up, brick by brick. This year we will launch several innovative partnerships that will expand on the progress that we have made to improve the health of our communities. The first two of these delays are often related to transportation. Rakai and Kyotera Districts are entirely rural. The roads and transportation infrastructure are extremely underdeveloped. Over 90% of our population live in remote villages, often many miles from a health facility staffed by a skilled birth attendant. With the exception of the one paved road that connects Rakai to Masaka, all others are poor dirt roads and for many communities completely lacking. Our region of Uganda has two rainy seasons, each of which is two to three months in duration. During these periods of heavy storms, our already poor roads may become slippery or are washed away and become impassable. In our districts of 518,006 people, there are only two ambulances, often lacking petrol to make referrals. All of these factors conspire to increase the delays of laboring mothers in reaching health facilities where our BAMA Program has worked diligently and successfully over the past four years to improve the quality of care. Rapid Emergency Response: Midwives at health centers can use their simple mobile phones to request emergency transport, using an automatic dispatch system. Local taxi drivers are alerted, and one is selected based on response time. Upon transporting the woman to the receiving facility, the driver is paid immediately with mobile money. Communication of Critical Information: Referring midwives use Mama Rescue menus on their phones to send clinical information to the hospital, ahead of the woman’s arrival. This enables the hospital midwives to prepare for the admission and reduces the wait time for services such as surgical procedures and blood transfusions. We are actively seeking funding to launch this innovative program this year. Uganda has one of the highest rates of adolescent pregnancy in Africa, with about 20% of young women becoming pregnant before the age of nineteen. A study completed at Makerere University in 2011 found that only 5% of pregnant adolescents stay in school during pregnancy and 25% rejoin after giving birth. With the support of Grand Challenges Canada, the Saving Brains/Mama Ambassador Program (MAP) is an initiative of Brick by Brick Uganda’s Babies and Mothers Alive (BAMA) Program to improve support for the 2,000 adolescent mothers who give birth each year in Uganda’s Rakai and Kyotera Districts. Through use of the BAMA Program’s existing community midwives and model mothers and fathers, Mama and Papa Ambassadors, the project will specifically identify, track, and provide both institutional and monthly peer-group support for adolescent mothers at Rakai Hospital to improve their well-being and stimulate their infants’ early brain development. Midwives and Mama Ambassadors will be trained in adolescent-friendly reproductive health care and we will establish adolescent health clinics for the first time in our districts. We will also establish newborn intensive care units at our two district hospitals. Our students reading at their new school library. Over the past fifteen years, we have partnered with local communities to rebuild nine Universal Primary Education (UPE) Schools serving 4000 students. In 2019, we will work with Knowledge for Children, a Dutch-funded NGO, that works with UPE schools to improve the quality of education, improve literacy and build a culture of reading amongst our children. Like Brick by Brick, whose partnering communities invest 25% of the costs of all construction projects, Knowledge for Children practices a co-funding model to ensure full engagement and sustainability. We will pilot this project in four schools beginning in February. 2019 will be an exciting year of innovation. You can follow our progress here throughout the year. We thank you as always for being a partner in our work. The Mama Ambassador Program (MAP) is an initiative of Brick by Brick Uganda’s Babies and Mothers Alive (BAMA) Program. 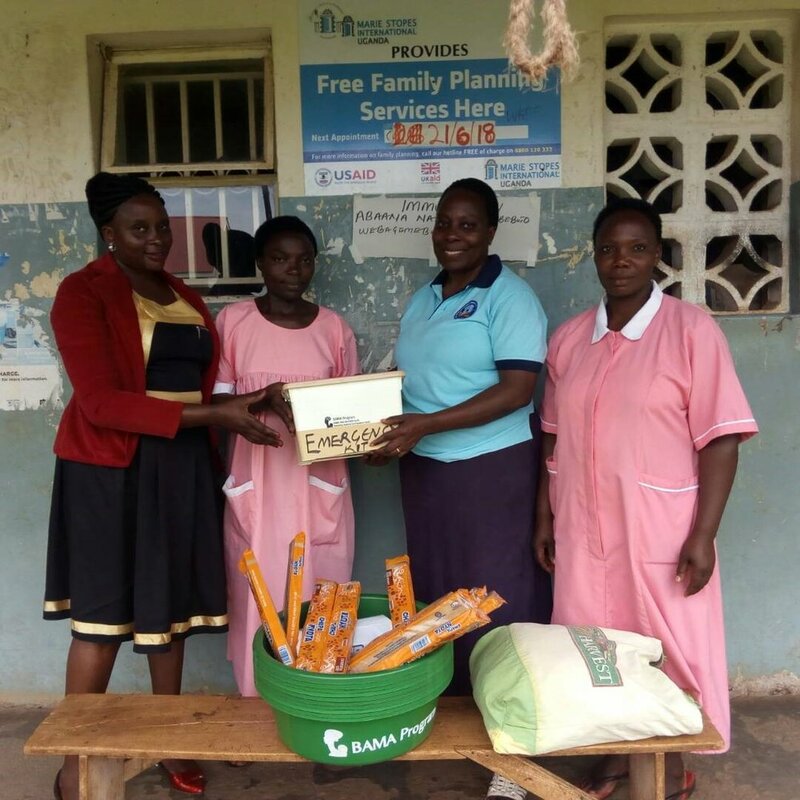 With support from Grand Challenges Canada’s Saving Brains Program, our goal is to improve the health and well-being for the 2,000 adolescent mothers and babies who deliver each year in Uganda’s Rakai and Kyotera Districts. Through use of the BAMA Program’s existing Mentor Midwives and model mothers, Mama Ambassadors, the project will specifically identify, track, and provide both institutional and monthly peer-group support for adolescent mothers at Rakai Hospital to improve their well-being and stimulate their infants’ early brain development. Midwives and Mama Ambassadors will be trained in adolescent-friendly reproductive, antenatal care and postnatal care, which will be available in our districts for the first time. In order to improve the quality of newborn care, we will be establishing newborn intensive care units at our two district hospitals. Our program focuses on providing emotional support for an especially vulnerable population of adolescent mothers. The goal of our monthly peer groups is to improve the wellbeing of young mothers and the normal development of their babies through play, communication, kangaroo care, breastfeeding and good nutrition. Our program will also actively engage fathers and extended family who will support our mothers. In Uganda 24% of adolescents become pregnant before the age of 19. Adolescents face a much higher risk of death and injury due to complications of pregnancy. In fact, these complications are the leading cause of death among women ages 15-19 globally. 3.9 million unsafe abortions are performed on adolescents each year, which poses a threat to the life and health of these young women. At Brick by Brick we believe that access to quality reproductive, maternal and newborn healthcare is a human right. Every day our BAMA team is working alongside the staff of our 48 partnering health facilities to improve the quality of care for mothers and their babies. This year, with the support of the Saving Brains Program, we will begin to address the needs of one of the most underserved group of women, adolescent mothers. You can support our work by clicking DONATE. Brick by Brick began its work in 2003, as a small project, partnering with rural communities in the Rakai District to completely rebuild crumbling free Universal Primary Education (UPE) Schools. While a free primary and secondary education are guaranteed by Ugandan law, it is often under-resourced leaving many schools in a terrible state of disrepair. All of our work is based on a strong partnership model. In each of the nine UPE schools where we have worked, the surrounding community has found the means to cover 25% of the cost of construction. Their contributions come in the form of labor, water, sand and other building materials as well as food and lodging for our skilled masons. This investment is no small feat, as our communities are very poor; it often takes several years to complete our projects. When our work is done there are new classrooms, a library, quality teacher housing and safe water and sanitation systems to serve students and teachers, creating a supportive learning environment for generations. Over the past fourteen years, nine schools have been transformed into Brick by Brick Schools, serving over 3000 students. In addition to providing a supportive learning environment, our work has directly impacted the health of our students. Without our rain water harvesting systems, children are forced to walk miles to fetch water from unsafe sources. Without Brick by Brick’s energy efficient stoves, schools struggle to provide lunch for their students. Our School Program was the foundation of our My Pads Program that has empowered over 4000 adolescent girls and young women with a comprehensive education in sexual and reproductive health. In 2014, we launched the LEAD-ORGANIZE-INTEGRATE training program to build the capacity of school libraries so that they become centers of reading and literacy. This year we are piloting the RACHEL system, which provides a low cost ‘server that can connect a whole classroom of computers to a world of educational content’ without the need of the Internet. This year we have expanded our creative partnerships with other international organizations working to improve the quality of education in sub-Saharan Africa. With California-based We Share Solar, we have provided solar powered light to eleven schools and introduced an innovative STEM-learning program. Partnering with Experi-Box, a Dutch NGO, we are supporting our students in having the opportunity to perform real scientific experiments for the first time. 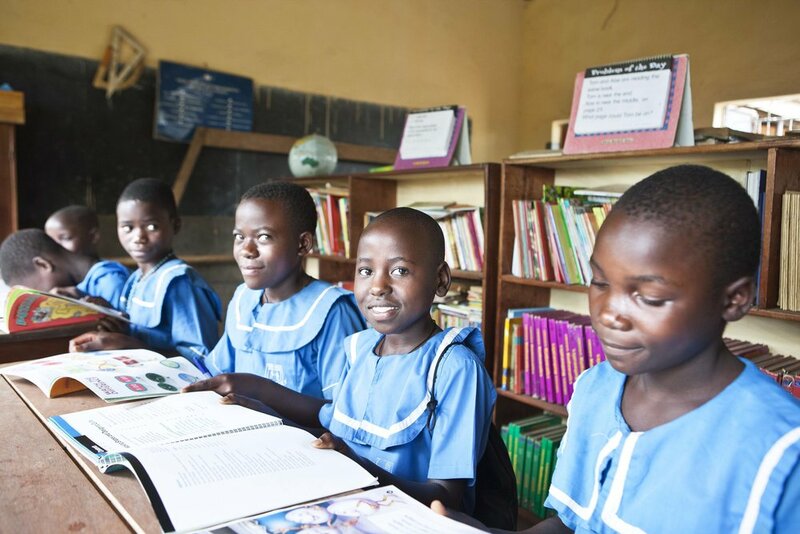 This term we will launch our partnership with Knowledge for Children, another innovative Dutch non-profit that helps Ugandan schools build a culture of reading through a powerful partnership model with local teachers. Brick by Brick’s mission is to create partnerships that improve education, health and economic opportunity. As you can see, our School Program depends on the contributions of many partners. Lest we forget, the donations of so many people, large and small make our work possible. So as we watch all of the children in our lives return to school, both here in Uganda and in the US, let’s rededicate ourselves to a world where a quality education is available to all. Eleanor Nakintu, Dr. Eleanor to the women of Rakai and Kyotera Districts, is the Clinical Director of the Babies and Mothers Alive (BAMA) Program. As a senior obstetrician-gynecologist, she has seen first hand the life threatening challenges faced by Ugandan mothers and babies. Eleanor describes in a few short minutes the difference being made by the BAMA Program. Meet Yiga Guster, one of over 100 Mama and Papa Ambassadors trained to serve expectant mothers in our communities. He works tirelessly, supporting them to fully utilize improved health services provided by our partnering health centers and hospitals. Yiga speaks about how BAMA has improved quality of care and referrals in our districts. Juliet Namaganda, is the Head Prefect at Bigadda Secondary School in Kyotera District. She was trained as a Peer Educator by the My Pads/DREAMS Program, which provides comprehensive education in sexual and reproductive health to Juliet and over 2400 adolescent girls and young women like her. Hear her tell her story of empowerment thanks to Brick by Brick's My Pads/DREAMS Program. In July of 2017, Brick by Brick Uganda's staff was joined by two inspiring young women from the Global Health Corps Fellowship Program, Geraldine Kauma and Liza Magill. As their year of service comes to an end, we asked Geraldine and Liza to share some of their experiences of working with Brick by Brick. BbB: What inspired you to apply to become a GHC fellow? Liza: My undergraduate degree is in International Studies, focused on global health, and I always knew that I wanted to move abroad after graduation to experience the realities of global health work in a developing world context. For GHC specifically, during the summer of 2016, I interned at Partners in Health, which is a placement organization for GHC, and learned about the fellowship program. GHC could not have fit my interests more--its social justice emphasis, focus on the structural injustices that create inequitable health care, and health systems approach were exactly the types of values that I wanted to be surrounded by during my time abroad. And of course, the co-fellow model was pretty attractive too. Geraldine: My undergraduate degree is in Mass Communication with a major in Public Relations,. Throughout school I had no desire whatsoever to do PR for corporate companies and was always interested in organizations that had an aspect of health and were in support of improving the wellbeing of communities. My past experiences doing communications had been working with HIV/AIDS NGO’s so when I heard about GHC, I felt like it would be a place to nurture my love for health communications, while interacting with other like minded young people from different walks of life. BbB: What has been the most surprising aspect of living and working in Uganda? Liza: There are so many; it’s hard to choose one. Now that we’ve been here for ten months, I don’t think about the surprises quite as much. But the first thing to come to mind is definitely how beautiful Uganda is--I’ve never been to a place more green, and I spent Christmas in the Rwenzori Mountains, which is one of the most picturesque places I’ve ever been. BbB: Geraldine, you have been asked to work with a multi-national team, what have you learned from Liza and the rest of our team about working cross-culturally? Geraldine: The co-fellow model has been an interesting one for me because as co-fellows, we live and work together. It’s always nice to hear her perspective on things and that has greatly helped me in working with other members of the team working outside Uganda. The diversity of ideas and experience makes the work experience a good one. BbB: What have been your most exciting successes? Your biggest challenges? Liza: My most exciting success has to be that we recently won funding for a pilot project from Grand Challenges Canada based on a grant proposal that I wrote earlier in the year. Grant writing is very arduous, with few successes, but the wins are very exciting when they do come! The opportunities that have presented since winning that grant, from presenting our project at the Ministry of Health to collaborating with our team of OB-GYNs and pediatricians working on the project, have also been some of my favorite moments. The challenges are more day-to-day and less memorable, but they mostly include living in a place where there aren’t any options to buy sweets or junk food. Losing internet everyday around 3 pm also isn’t the most exciting either. BbB: What inspires you most about your work with Brick by Brick? Liza: The people that we work with--no question. Our staff at Brick by Brick is collectively the most hardworking, dedicated group of people that I have ever met. They work long hours, on the weekends, with few supplies, but never, ever complain (I’m known around the office as the girl who reminds everyone that leave is important for self-care!) Especially since I’ve moved across the world, they’ve been the best support system I could have asked for. Geraldine: The team that we work with has been amazing! In spite of the usual limited resource settings, everyone here works so hard and so passionately to see that the goals of the programs are achieved. When you go into the community you can just feel the impact, every staff member is called “Musawo” (meaning Doctor), and it is a joy to see that the community actually benefits and is appreciative of the services across all our programs. That keeps me going! BbB: Where would you like to see Brick by Brick grow over the next 3-5 years? Liza: There are so many grant projects that I’ve helped design that I would love to see implemented over the next few years. I think there’s tons of interesting growth to be done with technology, and how to better utilize technology to track the outcomes of our programs. Cell phone coverage is increasingly available at our facilities and schools, and I see that as a huge potential that we’ve just started working with this year. Geraldine: This is an amazing organization and the work that it does is impacting so many people yet there is still so much need. I would like to see expansion into other districts to share the models of our work and support communities there as well. Improving the systems to track and monitor our progress at a national level would be a great addition. It’s right there in our mission statement. We create partnerships that improve education, health and economic opportunity. From the onset, we saw that as a growing Ugandan non-profit we could only deliver on our ambitious goals, given our limited resources, working hand in hand with our local communities. Our partnership model is not only dictated by our current revenue streams, but also from our experience that real progress in addressing the complex social and economic causes of disparities in health and education leading to chronic poverty can only occur when our communities are fully engaged, with Brick by Brick providing the seed capital for change. Traditional development strategies rely on billions of dollars in foreign aid. While this approach addresses the immediate suffering of the almost three billion people who live on less that $2.50 per day, it also fosters a cycle of dependence. Brick by Brick promotes an alternative, relying on strong, long lasting partnerships with local communities. So, Brick by Brick is different than other ‘charities’. In fact, we are not really a charity in the true sense of the word, which is defined as: the voluntary giving of help, typically in the form of money, to those in need. We start our work relying on the leadership of our local partners and full participation from the communities we serve. We take our direction from our Ugandan staff and local partners. We build strong two-way partnerships based on trust and a long-term commitment. Trusting partnerships do not happen overnight, they take time, in fact they take many years to build. This is the reason that our programs have focused on just two rural districts, Rakai and Kyotera with a population of a half million people. Community leaders know that Brick by Brick will be with them for the long haul that it takes to solve complex problems like crumbling school infra-structure, poorly equipped hospitals, or the lack of access to clean water. They also now that unlike other NGOs, we will require their vital contribution to achieve common goals. Over the past year we have experienced some real breakthroughs in strengthening our partnership model. The Lwamaggwa Health Center III is a remote and rural facility, serving a large population in need of quality health care. Its’ maternity unit is falling apart. This year, the Rakai District has committed $5000 in co-funding, allowing Brick by Brick to build a new maternity unit for our mothers and babies. The Rakai and Kyotera Districts also pay the full salaries for 105 mentor midwives, trained by Brick by Brick’s Babies and Mothers Alive (BAMA) Program. They work alongside our skilled staff to train the midwives who perform the 26,000 deliveries annually in our 25 health centers and hospitals. We Care Solar will partner with Brick by Brick to provide solar powered light to 35 health centers, while their colleagues at We Share Solar, will do the same for 11 primary and secondary schools. Vital Health Africa will work with the BAMA team to assess and train our physicians and midwives to improve newborn care helping us to save the lives of thousands of babies. This year we begin an exciting new partnership with the Dutch-based NGO, Knowledge for Children, who share our partnership model in improving the quality of literacy education for Uganda’s children. Our work has been recognized at the national level thorough our regular participation in quarterly meetings on maternal and newborn health. We have also been honored to receive funding and in-kind support from such internationally respected donors as the ELMA Foundation, the U.S. State Department’s DREAMS Innovation Challenge, Global Health Corps, the US Peace Corps and World Connect. In the U.S. we have an expanding community of partners who support our vital work for the people of Uganda. They are regular donors large and small, board members and other volunteers who give of their time and vital knowledge to help build our resources and ensure solid program management and oversight. Brick by Brick is so much more than our twenty full time staff both in Uganda and in the U.S. We are truly hundreds if not thousands of people who share the dream that every human being has the right to a quality education, health and economic opportunity. Brick by Brick is our vehicle to move closer to that day where our dream becomes a reality. This year, World Health Day falls under the theme “Universal Health Coverage: Everyone, Everywhere.” For Brick by Brick Uganda, this is especially relevant, as the Babies And Mothers Alive (BAMA) Program works to train and support health workers in even the most remote rural areas within the Rakai and Kyotera Districts. This includes comprehensive training, support supervision and the provision of emergency supplies and equipment to save the lives of mothers and their babies. Many a time the mentor midwives and BAMA staff have to get support to help push the car through the road in order to proceed to the hospitals. BAMA works with community members that are organized into Village Health Teams. After receiving training, they become BAMA Mama and Tata ambassadors who then work within the community, seeking out pregnant women, encouraging them to go for antenatal care, institutional delivery of their babies, and encouraging male involvement. I work with the VHT in Nangoma to encourage mothers to deliver from the health center in Nangoma. Before BAMA, many of them used to go to Tanzania to a private clinic called Kakwezi which is 3km away because there were no supplies here at Nangoma. The attitude was bad and no one wanted to come here but now the supplies that BAMA brought have made my work easier because I can refer them to the center knowing that they will get help and that they will get incentives of basins and soap when they deliver from the center. They themselves talk in the community and boast about the delivery bed that they now have at Nangoma. Below, a video of Yiga Guster also a Tata Ambassador who shares about how the BAMA program has improved the outcomes for rural women who seek medical attention in health centers. Since the beginning of the year, our team has also created emergency boxes distributed to health centers to support midwives to effectively manage obstetric and newborn emergencies. While we are supporting mothers to travel to hospitals and health centers, many times there are shortages in medications and supplies. The emergency toolkit has basic essentials such as cotton, scissors, gloves, and drugs that midwives can utilize to support mothers who come to the facility. This is all a part of our comprehensive interventions to reduce the number of maternal and newborn deaths arising from complications of pregnancy. Midwives receive the emergency toolkit and incentives. We believe that each small step and every partnership goes a long way in ensuring that we reach all pregnant women everywhere in Rakai and Kyotera to ensure the maternal and newborn health of our communities. You Can Join This Cause, Donate Today! MARCH NEWSLETTER: WHAT DOES IT TAKE TO SAVE A MOTHER AND HER BABY? Why is it that every day, 800 mothers die from almost entirely treatable complications of pregnancy and labor. Almost all of these women live in the developing world with sub-Saharan Africa bearing much of the weight of this silent tragedy. From extensive public health research we know that almost all of maternal deaths can be traced to one or more of three delays. First Delay: is the delay in the decision to seek care and is due to the the poor socio-economic status of women, a lack of knowledge regarding the risks of pregnancy and labor, as well as previous negative experiences with health care providers. Second Delay: is the delay to reach health care facilities due to poor transportation infrastructure as well as the cost of transport in many countries, especially in rural areas where most people live. Third Delay: is the delay to receive high quality health care, which is due to poor knowledge and skills of providers, lack of medicines, supplies and equipment as well as poor infrastructure of our health facilities. 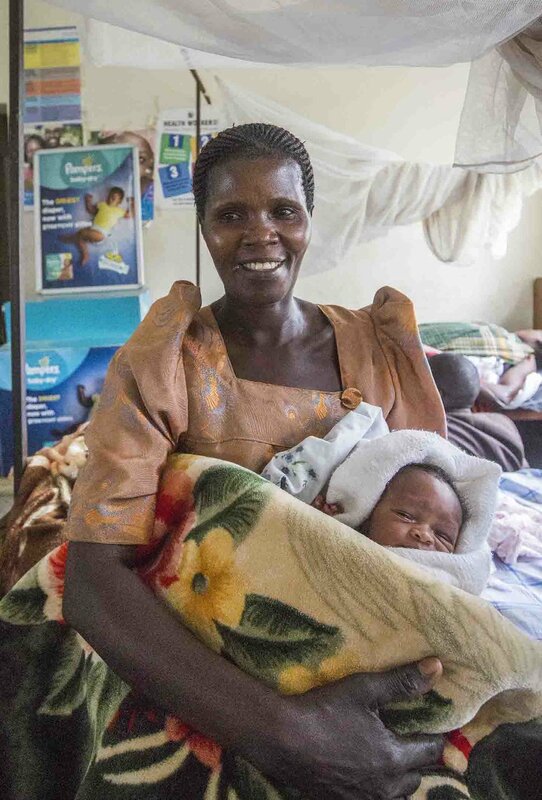 Since 2015, Brick by Brick, through its Babies and Mothers Alive (BAMA) Program, has been partnering with the Ugandan Ministry of Health to dramatically improve the quality of care at 25 government-funded health facilities providing maternal and newborn health care. We have trained all of the midwives and physicians caring for mothers and their babies in the Rakai and Kyotera Districts. In addition to a regular schedule of clinical trainings, our experienced staff work along side local health providers, mentoring them so that knowledge and skills attained in training are reinforced and strengthened throughout the year. In order to build our local health care system, we have also trained 30 Mentor Midwives, government employees who are now working with BAMA staff to improve the quality of care at each of our health centers and hospitals. In 2017, we are beginning to see that the strong partnership we have created is improving quality of care and saving lives. In 2015 and 2016, 19 women lost their lives each year due to complications of pregnancy and labor in our 25 health facilities. In 2017, that number was reduced to 6! While no woman should die from treatable complications, we are proud of how many mothers have been saved due to the determination and hard work of so many. We are also seeing a significant increase in the number of women delivering in health centers, from 53% of pregnant women in 2016 to 65% last year. In BAMA-supported facilities, among those expectant mothers who came for prenatal care, 81% delivered safely at their local health center. This as compared to just 65% in non-BAMA supported facilities. While we are encouraged by the impact we are having to date, to be honest, we are only scratching the surface of what is possible. With our limited resources, we currently have only one tenth of the funds needed to fully address the problem of maternal and newborn mortality for the half million people we serve, we have focused our work on the Third Delay, improving the quality of care at health centers and hospitals. We have sought to address supply chain issues for life saving medicines, equipment and supplies. But there is so much more to be done. To protect the lives of all of our mothers and babies we need to address the first and second delays. This requires a broad community-based approach that focuses on empowering women and their families with knowledge about their pregnancies, allowing women to have full dominion over their reproductive health choices. Now that we have worked to improve the quality of care at health centers, we need to increase the demand for, and utilization of, health centers and hospitals. We also need to improve transportation and referral systems, so that women can get to their health centers and that patients can be referred without delay, when the need arises. To accomplish our goal that no woman or baby should die from preventable or treatable complications of pregnancy, we need to expand our resources. Here's where you can help. On Wednesday, April 18th, Brick by Brick will hold its 7th Annual Blues Night Fundraiser. By purchasing your tickets to this great springtime event, you are partnering with us to save the lives of mothers and babies, empowering young women through our My Pads Program, and building safe and supportive learning environments in free primary schools in Uganda. Please take action now by clicking BLUES NIGHT! 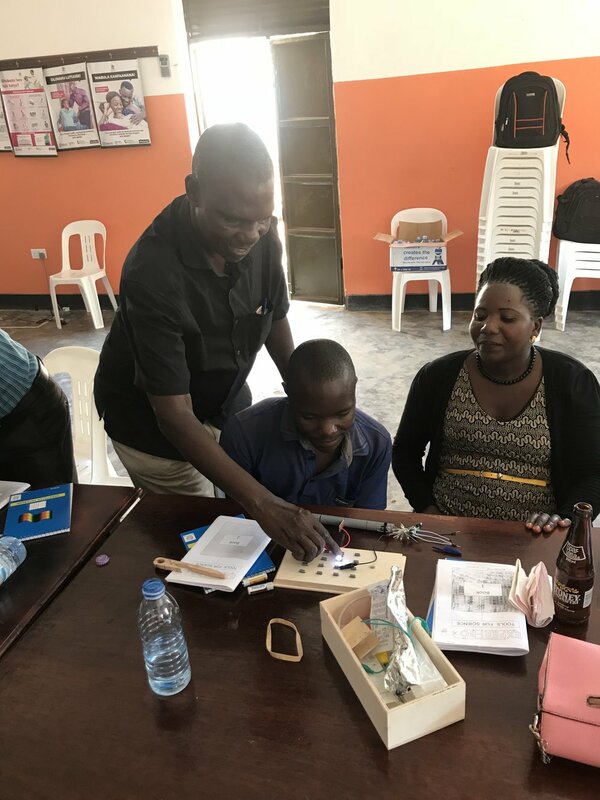 School Program Coordinator Max Ssenyonga Works with teachers using the Experi-Box to show how electric circuits works. One one of the great joys I have in my life is getting to visit Uganda multiple times a year to work alongside our amazing and dedicated staff. We have been working for the people of the Rakai and Kyotera Districts of Uganda for fourteen years and I am still moved by the strength and commitment of our Ugandan partners, not just our twenty-two full time staff but also the thousands of beneficiaries in the rural communities we serve. Arriving on Friday, I stepped into our offices and found that this week is a programmatic three-ring circus for Brick by Brick Uganda. We have three lively week-long trainings going on simultaneously throughout Kalisizo. Here at our own training facility, 22 teachers are receiving a Practical Science Training, led by Dutch Science Education advocate, Edward Wolfs. He is the founder of Experi-box.org. Edward shows teachers how to use his science lab in a box, with over 100 experiments available. Starting on Thursday, we will be joined by the We Share Solar team, who will be leading a STEM Training for our teachers, followed by the instillation of solar systems in 20 local schools! 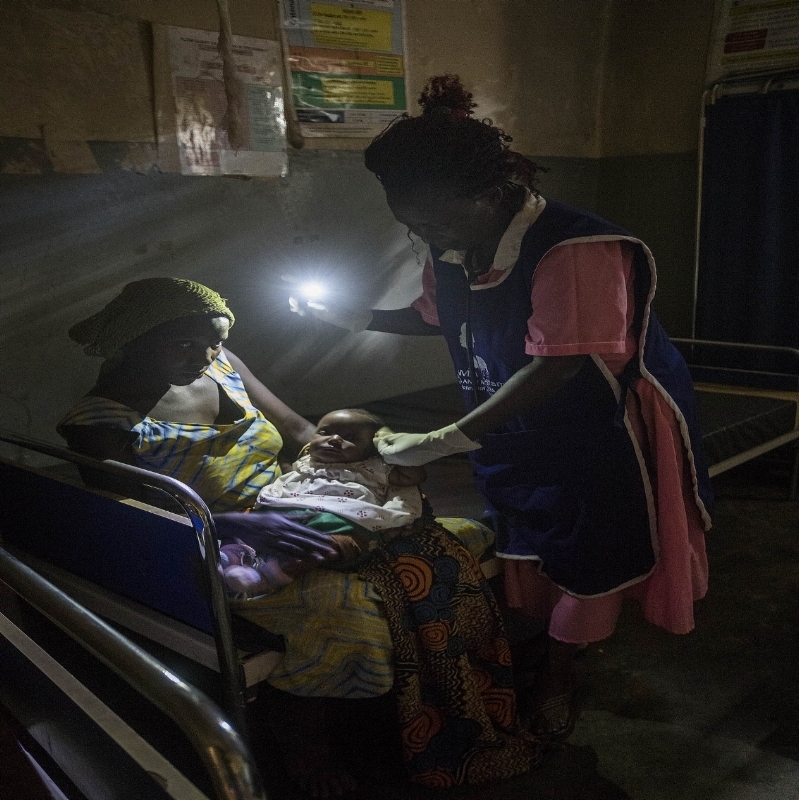 Over the next few months, we will partner with We Care Solar to provide light for the first time in fifteen maternity units who are now delivering babies in the dark. Just down the road, our My Pads/DREAMS team is leading a Training of Trainers workshop for 24 teachers and 30 peer educators from six secondary schools who will be facilitating our 9-session My Pads Program over the next three months. This innovative sexual and reproductive health program, gives adolescent girls and young women the knowledge and life skills to stay in school and reduce the risk of early marriage, sexual and gender-based violence and sexually-transmitted diseases, including HIV. With your support, it has already reached almost 2500 young women throughout Uganda, with 1000 projected to participate this year alone. Finally, our Babies and Mothers Alive (BAMA) Program is holding a training in life saving skills in emergency obstetric and newborn care for 20 local midwives. All of them work at Health Center IIs, which are now starting to provide maternal and newborn care in our rural districts for the first time. This is an important development, as it reduces travel time for laboring mothers in remote rural villages. This critical delay in skilled attendance at birth is a major cause of maternal and newborn deaths. So, clinical skills training, which giving our midwives the knowledge they need to care for all of our mothers and babies, is a major priority of the BAMA Program. For all of them, this is their first exposure to this level of training and mentoring. Meanwhile, I type away in the silence of a practically empty office, knowing that all of our staff are busy serving the people of Uganda. I couldn’t be happier!! Such good work, so many lives touched and none of it is possible without your partnership. If you want to learn more about our work, please join us for our International Women's Day event on Thursday March 8th 6:30 pm – 7:30 pm @ the offices of Houlihan Lokey 245 Park Avenue @ 46th and 47th. And SAVE THE DATE for our 7th ANNUAL BLUES NIGHT FUNDRAISER on Wednesday April 18th, 6:30PM-10:30PM at the Prospect Park Picnic House. On behalf of the half a million people we are privileged to serve, we thank you for all that you do to help make our vital work possible. In 2010 Brick by Brick launched our Internship Program. Since that time, fourteen bright and dedicated young people from the U.S., India and Uganda have partnered with our full time staff to serve the people of the Rakai and Kyotera Districts of Uganda. Unlike some internship programs, our interns are given the support as well as respect to produce extraordinary results in the one to three years that most spend in Uganda. The track record has been impressive. Jonathan Thayil-Blanchard, a Peace Corp volunteer, began working with Brick by Brick in 2010 when he found himself underutilized by his host organization. Jonathan was an engineering student, pursing his Masters Degree at the University of South Florida. When he came to our Executive Director with an idea to promote a sustainable technology, Interlocking Stabilized Soil Bricks that prevents the destruction of forests and wetlands promulgated by traditional brick making, our board was excited about the idea. Six years later, Brick by Brick Construction Company is a successful and profitable social enterprise, with 30 masons working on projects throughout Uganda. Engineering student and Peace Corp volunteer John Trimmer expanded on this good work and along with School Program Coordinator, Max Ssenyonga, grew the company beyond our local districts. Griffin Smith, at the time a recent college graduate, worked to build our organizational capacity, supporting our staff in basic computer and project management skills. Robin and Aaron Rentrope, were a powerful husband and wife team, who share a passion for social justice. All Robin did was launch our successful My Pads Program with Suzan Kyambadde, which to date has served 3200 adolescent girls and young women. Not to be overmatched, Aaron worked alongside Max to create our LEAD ORGANIZE INTEGRATE training workshop, which builds the capacity of school libraries. For the past two years, Brick by Brick Construction has been graced with the presence of James Murduca, a passionate and hard working engineering student, who has partnered with our Construction Manager, David Mutesaasira, to further expand our social enterprise, building QA systems that ensure that we are constantly growing our company’s mission to promote the Triple Bottom Line, People, Planet, as well as Profit. In July, we welcomed three new interns, Anjana Krishnan, a recent graduate from the University of Illinois School of Engineering, and Liza Magill and Geraldine Kauma, both Global Health Corp fellows who will serve as Development and Communications Officers respectively. These are just half of our interns. They are all extraordinary individuals, who have made a great impact during their service. Each and everyone has left Uganda a better place and taken the next exciting steps in their respective careers. If being a Brick by Brick Intern seems like a good fit for you, reach out to us at info@brickbybrick.org. 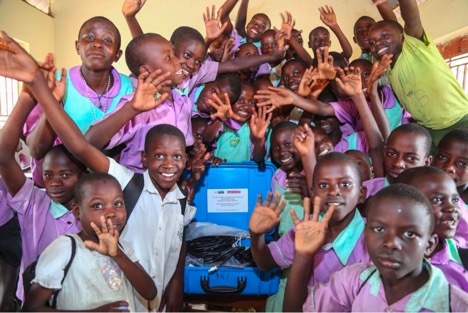 Brick by Brick Uganda is excited to be partnering with We Share Solar to bring light to un-electrified schools in the Rakai and Kyotera Districts. With the national examination period fast approaching, any time lost by the students or teachers is painful. The uncertainties in weather can make learning a game of chance, because if it rains heavily, lessons will often be cancelled because all windows and doors have to be closed to prevent rain from getting into the classrooms. This leaves the classrooms in complete darkness with nothing to do until the rain stops. For 14 year old Robinah seen in the video below, moving closer to the school was a decision made to help her concentrate on her studying and class work without worrying about trekking the long distances back to her home. She has not realized her full potential because in spite of staying near the library, at a female teacher’s home, she still cannot utilize the library after hours or before class because the school does not have access to electricity. We Share Solar grew out of the innovative Berkeley-based organization We Care Solar which provides sustainable solar power to maternity units throughout the developing world. 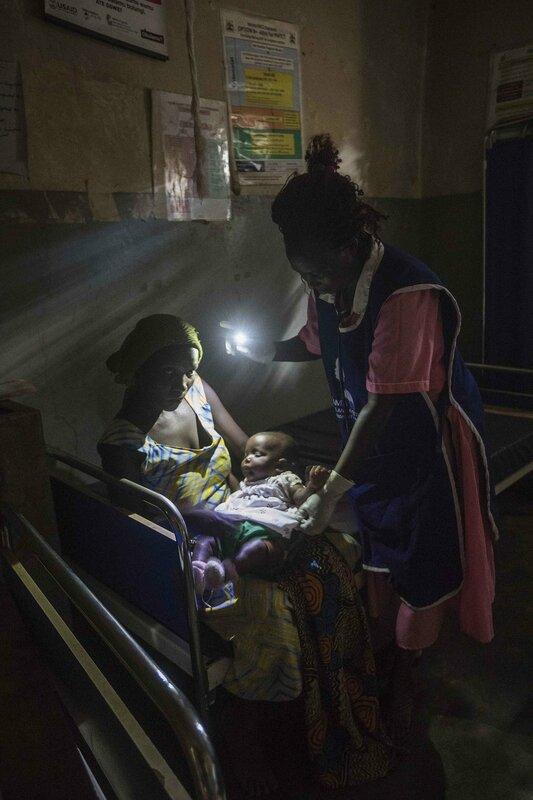 While working with the health facilities in rural Rakai, a team from the Babies And Mothers Alive Program secured the support of We Care Solar and we are now working together to help light every birth to reduce complications during childbirth caused by absence of light. 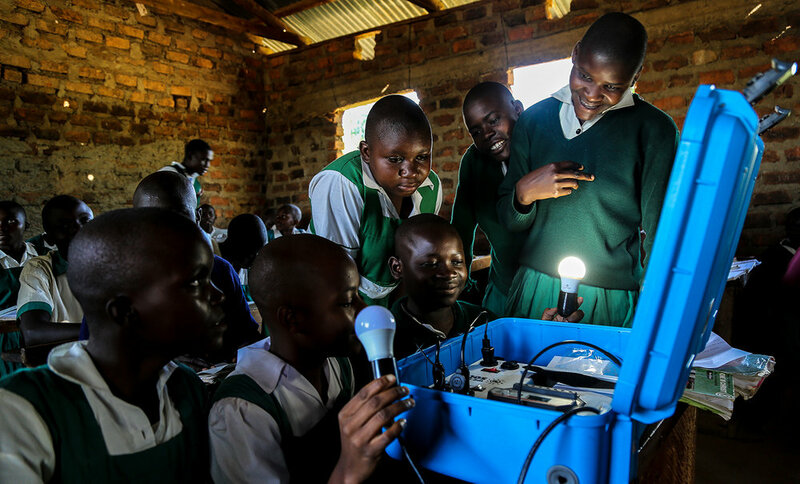 Brick by Brick has since been introduced to We Share Solar, creating a partnership to provide solar power for classrooms, libraries, dormitories and teacher housing for the primary and secondary schools with whom we work. With this initiative we hope to improve conditions for studying, increase academic achievement and student retention. We Share Solar provides solar suitcases that are built for long term performance even in harsh rural areas with the ability to provide light and charging facilities. We Share Solar has an innovative model. They train North American teachers and students to build the solar suitcases, providing an exciting learning experience in science and technology. So We Share Solar is a true partnership between students and teachers separated by an ocean but sharing a common vision of a quality education for all. We are very excited to be working with We Share Solar on this new venture. Watch this video and see the difference that this partnership will make in 2018! Today is the The International Day of The Girl Child, a UN-sponsored event to focus on the rights of the 1.2 billion girls living in the world today. Did you know that in developing countries, one in every three girls is married before the age of 18? That’s 700 million girls! In my country of Uganda, that number is even higher. According to UNICEF, 40% of Ugandan girls are married by age 18, a shocking 10% by age 15! Poverty is a major driver of early marriage, as some families who cannot afford school fees may seek to reduce their own desperate financial condition by marrying off their daughters. Poor girls are 2.5 times as likely to marry in childhood as compared to the wealthy. When young women marry early they inevitably drop out of school, limiting opportunities and reinforcing a cycle of chronic poverty. Girls who marry in childhood are more likely to be victims of intimate partner violence. Often this vicious cycle begins when girls drop out of school due to financial constraints, early pregnancy or chronic absenteeism due to the lack of access to menstrual hygiene products and knowledge. In rural Rakai and Kyotera Districts, Brick by Brick’s My Pads Program is working with the US State Department funded DREAMS-IC. DREAMS-IC is an acronym for Determined Resilient Empowered AIDS-Free Mentored and Safe - Innovation Challenge. Our program works to educate and inspire adolescent girls and young women, as well as adolescent boys and young men in secondary schools, that are between the ages of 15 and 24. These young people are then empowered with sexual and reproductive health knowledge, life skills, and the ability to make their own set of Re-Usable Menstrual Pads as well as knowledge on menstrual hygiene and management. Our lessons focus on gender equality, power dynamics and communication, encouraging our students to stay in school, thereby reducing the risk of child marriage, domestic violence, HIV and other sexually transmitted infections. The program is innovative in that it encourages male involvement in all the sessions, creating cross gender identity awareness as well as raising advocates among our boys to issues that the girls and young women struggle with. Meet Zahara Senyonga, a 19 year old peer educator with the My Pads/DREAMS-IC program who shares her experience on the benefits of being in the program. Meet Lugolobi Ramadhan, a 17 year old young man who speaks of his experience sharing his skills with his sisters back home and how the program has helped him teach his friends about menstrual hygiene and issues surrounding menstrual health. LET THERE BE LIGHT... AT EVERY BIRTH!! Every year millions of women deliver their babies in the dark. Imagine you are a woman in labor in the Rakai District of Uganda. You have managed to gather the resources needed to pay for your transport from your village to a health center with a skilled birth attendant trained by the Babies and Mothers Alive (BAMA) Program. You and your husband then travel the many miles on almost impassable dirt roads and finally reach the local health center late at night. Most of the 24 health centers where we work lack electricity, therefore women must deliver in the dark. This results in compromised maternal and newborn care. Brick by Brick is partnering with We Care Solar, an innovative non-profit organization that provides health facilities in areas without reliable electricity with highly efficient solar energy systems to power medical lighting, mobile communication and essential medical devices. Together we hope to light every birth for the half million people we serve. Watch this video to see what it's like to give birth in the dark. Click DONATE to help us LIGHT EVERY BIRTH! Brick by Brick has thrived because of the diversity of our international staff. In addition, to a skilled and dedicated team of Ugandan health and development professionals, we have been fortunate to have many international interns and consultants working along side our full time staff to realize our vision of quality health, education and economic opportunity available to all. This month, our DREAMS Innovation Challenge/My Pads Program team has been joined by Donna Maione. Donna is an experienced consultant with expertise in organizational change management. Her particular focus is on environmental sustainability. Donna is working with our staff on our Seamstress Project, which is part of our DREAMS/My Pads Program. Our goal is to address the lack of access to affordable menstrual hygiene products for rural women. This inequity for many adolescent girls and young women, contributes to high drop out rates, which in turn increases the risk of early and often forced marriages as well as HIV infection. Collaborating with our staff, Donna has been working on the design of the pads, our project work plan and budget, as well as the training materials for seamstresses and students. Over the past 14 years we have found that strong-cross cultural partnerships can be agents of change, as well as an opportunity for learning for all involved. Thank you Donna and the DREAMS Team! Webster’s defines charity as follows: generosity and helpfulness especially toward the needy or suffering, aid given to those in need, an institution, engaged in relief of the poor, public provision for the relief of the needy. All the major religious traditions emphasize the commandment to serve the poor or most needy. Zakat or the giving of charity is one of the five pillars of Islam, for the Jews it is Tzedakah. Charity is a major tenet of Christian faith as it is for the Hindu and the Buddhist. But you do not need to have a religious faith to value charity. Every year Americans give generously. In 2015, over 273 Billion dollars was donated and no one can deny that millions of people in need were served. And yet the typical ‘charity model’ has limitations which we ignore at our peril. Too often, especially in countries like Uganda, where Brick by Brick has been working since 2004, money is thrown at problems without the full engagement of the communities we are seeking to serve. All too often “the road to hell is paved with good intentions.” Ten years ago, the ‘PlayPump’ was an innovative sensation, a playground merry-go-round for children, designed to pump water from wells in rural African communities. The World Bank was sold on the project, as was the CEO of AOL. The U.S. Government, with the support of First Lady Laura Bush, awarded a $16.4 million grant and other big donors started to line up behind this great idea, merging an urgent need for safe, clean water, with children’s need for play. Despite the millions raised and spent, no one had sufficiently engaged the communities who would be served by this intervention, and thus many practical aspects were overlooked. Simple things like the fact that children soon tired when pushing the PlayPump or that some were seriously injured or that the simpler hand pump provided five times the water with much less effort. The hand pumps were actually preferred by local women who found pushing the PlayPump exhausting and demeaning. We don’t have to look that far to see the folly that can come when the ‘power of good ideas’ are given too much weight, overlooking the views of our partnering communities and disregarding the importance of culture in effectively addressing any problem. We can look in the mirror! In 2010 we noted that 80% of our students did not eat lunch on a regular basis. As a small community-based non-profit we were looking for an innovative and sustainable solution to what was basically a lack of resources for a school lunch program at our five partnering schools. Partnering with industry leaders here in the U.S. and piloting the Egg Module, a comprehensive tool to support small-scale poultry enterprises in the developing world, we launched the Poultry Project. Our business model was well researched and sound, good enough to attract a major investor with a proven track record. We partnered with a successful poultry farmer, with a ten-year history of success locally. And yet, while all the pieces for success were in place, with a skilled management team on the ground, after two years, our promising project ended in failure. After an exhaustive and honest self-analysis, we had to face the fact that throughout this project, we had failed to fully empower our Ugandan partner. Misunderstandings and a profound lack of cultural intelligence led to critical mistakes that doomed the Poultry Project. While we do not covet failure at Brick by Brick, we have found that confronting our mistakes with honest humility can be an effective strategy for success. All of our programs now conform to a model built on open and consistent communication with our partners, who are also the beneficiaries of our programs. We always begin with the identification of a critical need by our Ugandan communities. Close monitoring and evaluation inform our program interventions. All of our successes to date have been a close collaboration with our partners. For example, we have completed or are currently engaged in the construction and renovation of nine free Universal Primary Education Schools serving over 3000 students. All of these schools have been re-built with a 25% contribution from the surrounding rural community. In 2012, after a survey of 139 girls and young women, we launched the My Pads Program, an innovative program that trains local teachers to share vital reproductive and sexual health knowledge with their students, while addressing the need for affordable menstrual hygiene products. Last year, the U.S. Government, with a DREAMS Innovation Challenge, recognized this program, allowing us to expand to sixteen local secondary schools and include the training of peer educators throughout our district. Maternal and Newborn mortality is a serious problem, recognized by both national and district-level health leadership. Our Babies and Mothers Alive (BAMA) Program is a vital partnership with the Rakai District Department of Health, to dramatically improve the health of mothers and their newborn babies in the Rakai District. Without the on-going support of local government, and the participation of our 24 partnering health facilities, we would not have shown significant reductions in life threatening complications after only one year of work. Success for Brick by Brick is two-fold. We measure the direct impacts of our programs that improve education, health and economic opportunity. But that is not enough. Our model of building partnerships means that we are only successful if we are including the communities we serve in all aspects of our programming. In the end, we are only as strong as the communities we serve; building their capacity is the true measure of our success. Coming in the July Newsletter: Being a Social-Investor: How are your dollars changing lives? James Murduca is a son of New Jersey with a heart of gold. While pursuing a Masters Degree at the University of South Florida in Civil Engineering, James learned of the work Brick by Brick was doing for the people of Uganda. James believes that access to clean and safe water and sanitation systems is a human right. This month we interviewed James about his two years working with Brick by Brick. What has inspired your interest in engineering in the global context, especially tackling tough water and sanitation issues that are common in the developing world? Ever since deciding to pursue a career in engineering, my purpose has always been to use my skills and to develop projects in the field to improve the quality of life for people around the world. Upon graduating from The College of New Jersey with my Bachelor of Science in Mechanical Engineering in 2013, I knew that I enjoyed my fluid mechanics courses and was deeply passionate about water as a precious resource. Having learned that millions of people have limited access to basic amenities like clean running water, I desired to utilize my time and skill set to improve this situation by any means possible. However, I did not know how I could do this. While considering different opportunities and career paths, I discovered a program that included pursuing my Master of Science in Civil Engineering with a Concentration in Water Resources at the University of South Florida and a two-year internship experience with Brick by Brick to focus on water and sanitation. Given my career and service objectives, I could not think of a better option. You have been working with Brick by Brick Construction Company for almost two years, what accomplishment/s are you most proud of? Generally, my favorite accomplishments are when our staff work as a team and use our diverse talents and experience to complete a task or a project most effectively. One example is from a time when we needed to assess multiple clients’ school sites for upcoming projects. Given the fast growth of the company, we have been receiving many more inquiries requiring us to use our time more efficiently. Approximately a year into my service, the construction manager, David Mutesaasira, and I needed to assess four distant sites. Combining David’s communication skills and my strategic planning, we were able to assess all four sites in one day, which would have seemed impossible at the time of my arrival. Effectively combining our strengths to arrive at the best possible outcomes is when I feel most proud of our work. Another time, a headmaster of a school asked David to alter an original design to include a security light at the expense of losing the only light in one teacher’s residence. David and I discussed this issue and were able to adjust the design, such that the security light and the teacher’s light could be included without requiring additional equipment. All of us who work in development deal with failure. Can you tell us a brief story of where you/we have failed and what we have learned from it? One failure was when we unintentionally constructed one of our latrine projects at a larger scale than the original design approximately four months after my arrival. The latrines now had unnecessary stances for the students, and the additions increased the cost of the project. Adjusting the construction would have required a further increase in the cost, so the client now had a latrine with more stances. Recognizing this mistake, I reflected on the causes. In regards to construction and development projects, clear and consistent communication are extremely important for success. This issue could have been prevented with improved communication. As a result of this experience, I have focused on effective communication with all staff to ensure that all of us have the same understanding of our shared work. I have learned that expressing any uncertainties, doubts, or misunderstandings and confirming mutual understanding among teams are extremely beneficial toward producing the best outcomes. You are currently working on a very innovative research project with the support of Brick by Brick. Can you tell us a bit about what you are working on? My research project includes both a water needs assessment and a feasibility study of a sustainable water treatment technology. The water needs assessment includes surveys on water managers’ attitudes, knowledge, and practices of drinking water management, an observational sanitary inspection, and quantitative water quality tests. The treatment technology uses excess heat from a stove to disinfect water constantly flowing through a coiled pipe embedded in the chamber. This technology encompasses the three pillars of sustainability: economic, social, and environmental. The system is inexpensive to construct and eliminates the need for additional fuel for boiling because cooking and heat treatment are performed at the same time. The system also uses local materials and heat treatment, which is a commonly accepted and understood type of effective treatment option. Lastly, this system reduces the amount of fuel, which is often firewood, hence preventing deforestation and greenhouse gas emissions. The construction staff and first users’ have been eager to test and use the system. After explaining the system to the cook, Maria, at the pilot school, she was very happy to reduce time needed in boiling water for the children. James, you leave Uganda in July after two years of dedicated service, what's up next for you? I am extremely grateful for my experience working with Brick by Brick, and I will continue to make the most of the rest of my time in Uganda. I will be defending my research in Tampa over the upcoming ‘17/’18 academic year to complete my degree. In addition, I am currently seeking a job that fulfills my purpose to use my skills and to work on projects in this field to improve the quality of human life. Lastly, my time in Uganda has helped me understand and appreciate my personal values. After my departure, I plan on living a life that focuses on my values that include but are not limited to my professional service, health, educational growth, leisure, and last but certainly not least my family, friends, and my dog, Simba. I am so grateful for the opportunity I have had to serve our Ugandan communities these past two years.